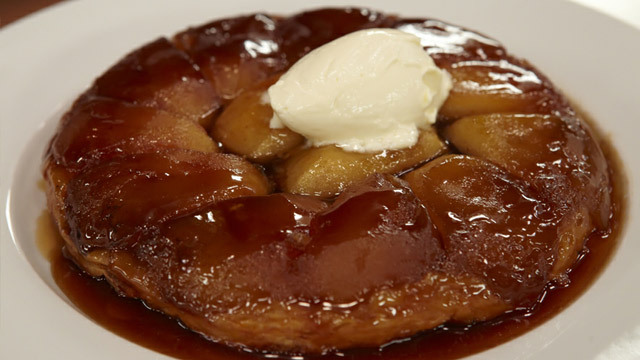 Apple Tarte Tatin (tah TAN) is a classic French, caramelized apple upside-down dessert. Each wedge is thinner than traditional apple pie and has a lovely, rustic glow. You can serve your Tarte Tatin warm or cold. Purists say to eat it warm. I prefer to refrigerate the tarte overnight. This allows the flavors to harmonize into that wonderful sweetness….you’ll come back for more!! 1. Preheat a fan-forced oven to 180°C. 2. Roll out the puff pastry into a round that it is 2-3cm bigger than an ovenproof 26 cm cast-iron frying pan. Prick the pastry all over with a fork and place it on a baking tray in the fridge to rest. Meanwhile, mix the apple with the lemon zest and juice and set aside. 3. Cover the base of the frying pan with the sugar and top with the butter. Place the pan over high heat and stir for 4 minutes until the sugar and butter turn a light-caramel colour. Remove the pan from the heat. Place the apples on top of the caramel concentric circles, starting from the outside of the pan and working your way into the centre. Lay the pastry on top of the apples and use a spoon or your finger to push the pastry down around the apples against the edge of the pan (effectively tucking them in as if with a blanket). 4. Bake the tart for 35 minutes or until the pastry is a deep golden-brown. Place your hand on the top of the pastry and gently rotate the tart a few centimetres to ensure it has not stuck to the base of the pan. If it has, pop the pan back into the oven for 2 minutes to melt the caramel a little. 5. Place the plate over the tart and invert the pan in one smooth movement so that the pan is now on top. Lift off the pan to reveal the tart. Serve slices of tarte tatin with a generous dollop of crème fraîche or ice cream. Crème fraîche or ice cream, to serve. This entry was posted on July 16, 2010 at 8:13 am and is filed under Cooking, Family, Friends, People, Personal, Random, Recipe with tags Apple Tate Tatin, apples, BUTTER, French, puff pastry. You can follow any responses to this entry through the RSS 2.0 feed. You can leave a response, or trackback from your own site. I totally agree. 🙂 Have fun today. superb and sweet treat, thank you for sharing! Oh, yum! And it’s not fattening either . . .